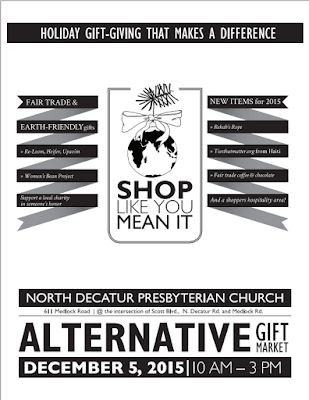 North Decatur Presbyterian Church invites the Medlock neighborhood to our annual Alternative Gift Market, Saturday, Dec. 5, 10 am to 3 pm. Children’s Craft Corner provided to engage your children while you shop. 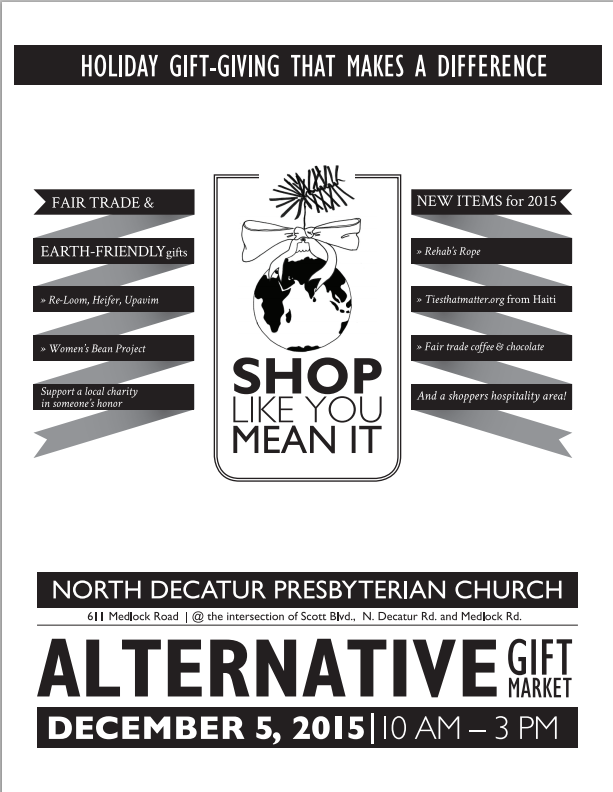 Shop for fair trade*, environmentally sustainable and reasonably priced holiday gifts, including many new items this year. Gifts for sale include olive oil and beautiful carvings from Palestine; hats, scarves, clothing and gifts from Latin America; delicious soup and cookie mixes made in the U.S. supporting people in transition; rugs and other gifts from local refugee and affordable housing initiatives; beautiful beaded jewelry from Rwanda; Haitian baskets and metal work; fair trade coffee, tea, cocoa and chocolate; and beautiful handmade cards from around the world. Holiday Gift Cards benefiting a birthing center in Guatemala and a school for the Eco Villages community in Haiti will also be sold.